How can new publishers comply with your intranet standards? Implementing publishing standards that meet your organisation’s requirements helps create a consistently good experience for people accessing your intranet. They are critical to you implementing a successful governance framework. The publishing standards will support your intranet strategy, publishing model, roles and responsibilities. All your content owners and editors need to comply with the publishing standards. Knowing this, people will access your intranet and use it more, confident in the integrity of the content and applications and aware that you ensure publishers comply with each standard. And that can be the weakest link in your governance framework! How do you continue to provide that consistently good user experience with new publishers? I am talking about publishing accredited – news articles, company policies, etc. – content, not collaborative – blogs, discussion groups, etc. – in this post. Your governance framework must cover how you manage new content owners and editors. This is the best way to sustain the baseline you have established for best practice. Without it, people will inevitably see a decline when they access your intranet. Their productivity and effectiveness risks declining and affecting their overall work performance. Induction training on how to use the publishing tool. This is not just about what to use it for. It includes how to use the publishing templates. It needs to covers features like global navigation bar, content owner, review and last updated dates. By explaining why this is important it helps encourage best practice. Have good communications channels so new publishers can keep up to date with the latest news that affects them. Publishers should be able to ask other publishers for help and get answers. New publishers should feel they are fully informed about how they use the intranet. Offer clear online guidance and best practice tips on how to publish on the intranet. Reinforce this when you contact content owners and editors e.g. email, discussion group, conference call or webinar. Invite all new publishers to join a discussion group covering publishing topics to help develop a broader understanding. It is much easier (and cheaper) to have peer-to-peer conversations where practical tips are shared quickly with each other. Have one set of publishing templates that you manage. Keep publishing simple and easy to encourage best practice. One publishing process will save content owners and editors’ time. It avoids the temptation to try alternative methods or create more templates. 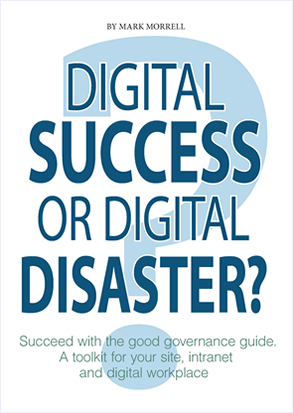 Find out more information on how to manage your publishing community and intranet from my new book ‘Digital success or digital disaster?‘. Read the introductory chapter to find out more. A license to share the ebook with publishers across your organisation is also available. After you have developed a clear intranet strategy as explained in my post ‘How to develop an intranet strategy‘ you then need to follow this with an implementation plan, publishing standards and a governance framework. The size of your organisation will affect how you manage your intranet. If it is based in one location and you know everyone by their first name then it is likely you can manage your intranet on your own. If it has many thousands of people in many locations you will need a different approach and involve other people to help you manage your intranet. The type of organisation will affect how you manage your intranet. Is it streamlined on administration, informal decision-making? Or is it more formalised, committee driven, when making decisions on how publishing standards and intranet roles and responsibilities? The culture of your organisation will affect how you manage your intranet. Is it a very top down, command and control, culture with feedback discouraged? Or is it more open, democratic and consensual? Whether it is either or a mix of both will influence your approach to managing your intranet. My first-hand experience and from working with clients is that intranets can be managed well no matter what size, type or culture your organisation has. It is how you approach this which is the critical success factor! You can out more information on how to manage your intranet to help you. Chaotic or consistent: What is your intranet experience? I recently wrote a guest post on how you can change a chaotic intranet experience into a more consistent and better experience. I showed how a governance framework that has roles, responsibilities, and publishing standards that are implemented smartly can encourage people to use the tools and information more frequently and deeply with consistent design, features and structure. You can read ‘Chaotic or consistent: What is your intranet experience?’ here. To coincide with my last post ‘Why you need a mobile strategy‘ in my current series on the mobile workspace, I was interviewed by the Journal of Internal Communication for an article about the potential of mobile devices when developing internal communications strategies. I gave my views on the importance of people using mobile devices to be communicated with and to communicate and collaborate with other people while away from their normal place of work. People have always been outside of the office space however, mobile technology now enables you to get messages out to them quickly – something that wasn’t possible in the past. This doesn’t only affect remote workers or employees who travel a lot: work is increasingly shifting towards mobile devices. The traditional situation where employees were using a desktop and ‘consuming’ communications during specific hours of the day is over. Increasingly, they will want to share things anytime, anywhere, and to be updated instantaneously. So there’s a whole new audience out there that internal communicators need to get to know. You can read ‘The benefits of incorporating mobile devices into your strategy’ in full for free here. From my time working in BT and with clients such as Centrica, internal communicators sometimes feel left behind or threatened by it. Actually I believe it is the opposite! This is a great opportunity for internal communicators to take a more strategic, value-add, position and plan how to take full advantage of the benefits this new way of working technology is offering. If you want more information or advice please get in touch. …or is this a better way to rebuild SharePoint 2010 content? In my last post I talked about the first of three approaches to rebuilding your content from your existing publishing tool in to SharePoint 2010. For each approach it is the conflict between minimising the impact on performance of the business with the cost of extra contractors while retaining the knowledge and experience of using SharePoint 2010. There isn’t just one answer and it can be a difficult choice to get right. My second approach combines the use of your content editors with external contractors. Your contractors will have a more extensive role to play than my first approach. You hire external contractors who have the experience and skills you need to support content editors and can rebuild more complex content more easily or rebuild a large number of content pages more quickly than your content editors. Wherever possible priority must be given to your editors rebuilding their content with support from contractors with the right expertise to help. However the option for a contractor to step in and take over is now available with this approach. Combining your own content editors with contractors skilled and experienced with SharePoint 2010 will still enable you to retain the knowledge and skills gained from your editors being trained on how to use SharePoint 2010. Your editors will use their knowledge of your organisation and the context in which the newly rebuilt pages are developed. The knowledge gained during the rebuild will be retained and allow content editors to support other existing and new content editors when they are trained. This approach can also help create ‘Super Users’ who can provide support to other content editors who are trained in future. Contractors supporting content editors and rebuilding complex and large numbers of content pages will be able to use their SharePoint 2010 expertise and knowledge. There is still a risk of disruption to normal business activities if there are many content editors to train and content to be rebuilt. The ability of editors to become ‘Super Users’ retrain other content editors is more limited as there are less editors who rebuilt content and probably not the more complex content. The balance of knowledge gained to lost is more balanced with this approach. You will also need to have extra checks for the content rebuilt by contractors to confirm the right context has been met and it links to other related pages correctly. This can extend the length of the project. There is the cost of the contractors to factor in and making sure you train enough content editors with the right skills so that all types of content are updated and managed correctly after you launch. In my next post I will cover my final approach to rebuilding your content.